The River Loddon: A Navigable Waterway? The River Loddon marks the border between Arborfield and Newland to the s outh and east, and Earley and Shinfield to the north and west. 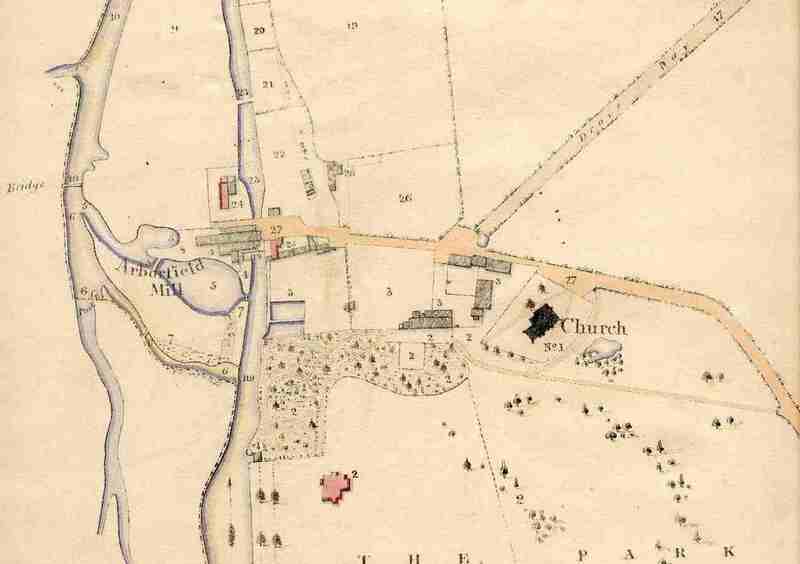 We know that there were two settlements near the river - around the old Arborfield Church, and towards Carter's Hill. The Loddon provided power for several mills along its length. But was it also used to transport passengers and goods? There is evidence that it was, and we would like to hear from anyone who has documentary proof. The River Loddon meets the rivers Blackwater and Whitewater at Swallowfield. Nearby is 'Barge Lane'. Did this mean that sailing barges from the Thames ventured up the River Loddon as far as Swallowfield? "The garden is so beset with all manner of sweete shrubbs that it perfumes the aire. The distribution also of the quarters, walks, and parterres is excellent ; the nurseries, kitchen garden, full of the most desirable plants ; two very noble orangeries, well furnished ; but above all, the canall and fishponds, the one fed with a white, the other with a black running water, fed by a quick and swift river, so well and plentifully stor'd with fish that for pike, carp, breame, and tench I never saw anything approaching it." "Sir Henry Russell, after his return from India, paid several visits to France and Italy, whence he brought back many of the pictures and furniture now at Swallowfield ; but he spent most of his time at Swallowfield, interesting himself in improving his property, to which he added considerably by the purchase of the largest part of the Manor of Arborfield, and the land going by the name of ' Kenny's.'" 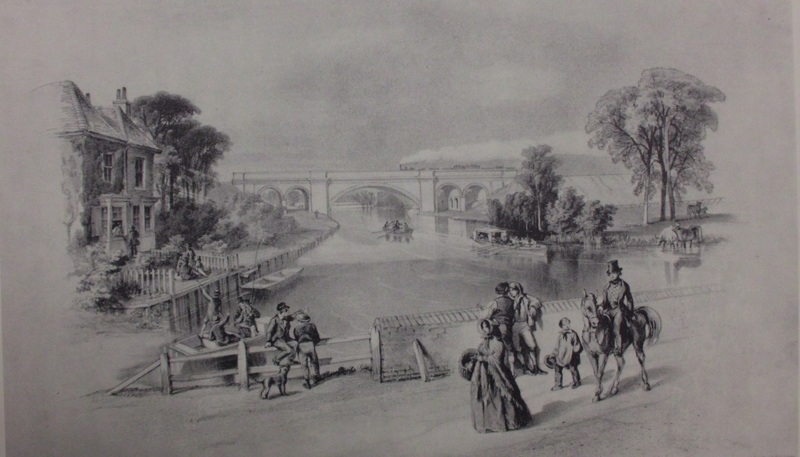 "Amongst other alterations, Sir Henry filled up the canal which appears in the old prints of Swallowfield : it ran from the Lock Pool near the church to the Bow Bridge ; and he also built the two bridges outside the park and the Church Lodge. The two rivers, the Loddon and the Blackwater, join in Swallowfield Park. The Loddon, the subject of Pope's fable of ' Lodona,' rises near Aldershot and enters Berks in the parish of Swallowfield. It crosses the Wokingham and Reading road at Loddon Bridge, and falls into the Thames near Wargrave." 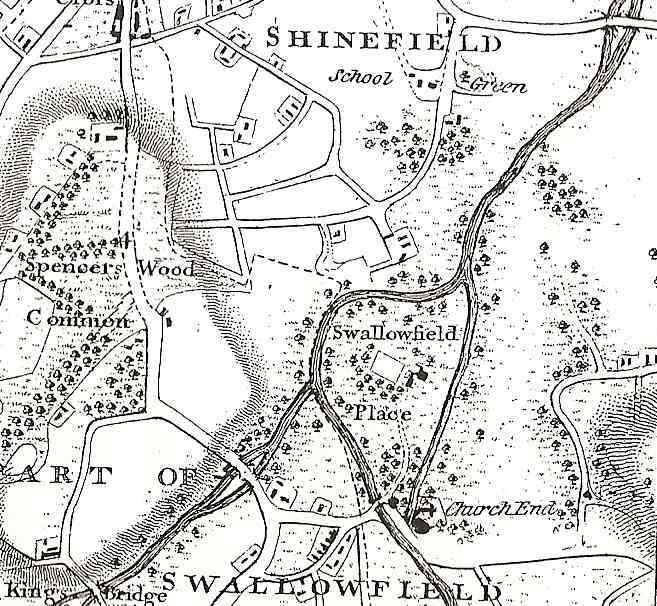 Berkshire Record Office has an Enclosure Map of Swallowfield from 1817 that clearly shows the canal, and it can be seen by clicking here. See the article on Arborfield Hall in 2011 for photos of the Lock Pool. Further downstream, there was a similar Lock Pool at Sindlesham Mill. "The Thames, in its course from Caversham Mill to Earley Point (about three-quarters of a mile this side of Sonning Lock) runs in an arc, and within this arc is the Kennet embouchure. The wide circular sweep can best be seen from the high embankment of the Great Western Railway. From very early times there existed in the Liberty of Earley six common fields and a common mead, the latter bordering the Thames from a spot just below the present Dreadnought Inn to Earley Point, where the boundary of the Liberty was situate. These great fields represented, until the enclosures of the 18th and early 19th centuries, the mainstay of economy in the district from long before the Norman invasion. The only one that concerns us in these notes is that called Wharf Field, which derived its name apparently from the presence of a wharf at the junction of the rivers. Wharf Field was the north-westerly of the six and reached to the angle formed by the Kennet and the Thames. On its western side it touched the boundary of the borough of Reading. The Wharf itself seems to have extended from a site now occupied by an inn called The Jolly Anglers on Kennet Side to the site of The Dreadnought. "Now, slightly to the west of the point at which the boundary strikes the Kennet was anciently a lock belonging to the Abbot of Reading and called Brokenbrow, or Brokenburgh lock. It is obviously associated with the piece of land upon which the Saxon cemetery was discovered, and the name would seem to be Saxon in origin. "In the year 1404 the Abbot bethought him of an additional method of increasing the monastic revenues. Before traders could bring their merchandise by boat up to the common landing place at the High Bridge in Reading, or carry it thence, they were compelled to pay toll to the Abbot for passage through his lock and the waters which ran within the precincts of the Abbey. "It is common knowledge that for several centuries the relations between the Gild Merchant of Reading and the Abbot were not exactly cordial, and the establishment of a wharf just outside the jurisdiction of the Abbot may have been the outcome of a determination of the merchants of Reading to evade the monasterial imposts and, after landing their produce at the Wharf at Earley, convey it overland without further interference. Similarly as a point of departure for London and Oxford bound traffic the Wharf would have been effectual in evading the abbatial exactions. This, then, may be an other reason for the origin of the Wharf; but, while it is entitled to consideration, undue weight must not be attached to it; there may have been other and more cogent reasons why the Wharf was fixed here, and they may yet come to light." So could the River Loddon at Arborfield and Sindlesham also have been equipped with locks at such an early date? 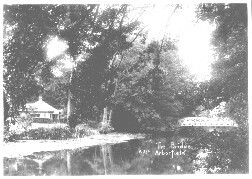 The river claimed at least one life from a boatman, that of John Dymott, butler to Mrs. Hargreaves at Arborfield Hall, in 1917. The Arborfield Hall Estate had two boat-houses, and the Simonds family of Newlands had a boathouse on the River Loddon, as shown on the 1881 Ordnance Survey 6" map. 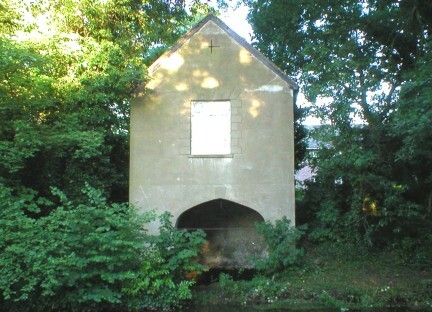 The boathouse near the site of the old Hall still exists, as shown on the right. However, the boathouse that was let by Carter's Hill Farm to John Simonds in 1919 is gone - it was near where the M4 crosses the Loddon. At Sindlesham there was another boat-house near to Mill Lane, just downstream of the cluster of cottages by the motorway. The area was marked as 'Brick Bridge' on the O.S. map, though the crossing itself has long since been replaced by a metal Bailey Bridge. At Winnersh, rowing boats used to be available for hire at the George P.H., as shown on old post-cards. A little further downstream, another boat-house is shown off Colemansmoor Lane in Woodley. The George Inn is to the left. There are punts on the water, and to the right, four men are rowing a party of people who sit under a canopy at the stern. 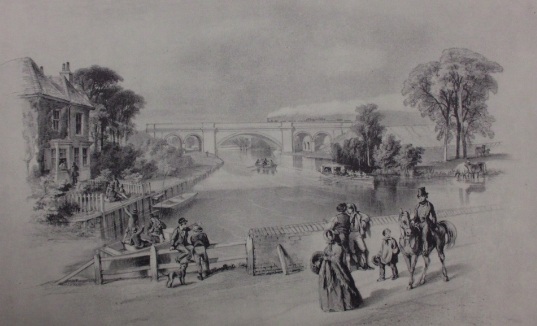 It is written somewhere that this railway bridge at Winnersh had to be a certain minimum height above the river to allow navigation, so the illustration shown above might not be as fanciful as it seems.